Pizzazz tyvek wristbands. This is another colorful option for your event security. Great for pool parties due to their waterproof nature. Pizzazz pattern tyvek is yet another colorful option for event security. The size is 3/4" x 10". Each wristband is sequentially numbered to enhance security as well as provide a means to keep track of attendance. The other security feature are the tamper proof slits, backed by an aggressive adhesive. 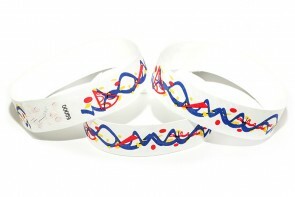 The wristbands are easy to apply. Simply remove the covering from the adhesive, wrap the band around the wrist, and adhere it onto itself. If someone tries to peel it back in an attempt to apply it to another person, the adhesive holds and the tamper proof slits shred apart making reuse almost impossible. 1 Quantity = 500 Wristbands. Quantity Discounts apply starting at 10 boxes. The discount will be figured in your shopping cart upon checkout.